Last month I wrote about changing pump cannulae, and pointed out that many people don’t replace the cannula and pump reservoir at the same time. In fact many people replace a cannula without replacing the tubing to the reservoir. In some ways I think replacing the tubing no more frequently than the reservoir can make sense. Here in Australia we get our supplies via the NDSS, and most cannulae are supplied bundled with their matching tubing. So if you replace the cannula with a new one but re-use the tubing (so you don’t need to disturb the reservoir) you end up throwing away the new tubing. Outside Australia many infusion sets can be purchased either bundled, or as separate tubing and cannulae sets. Here in Australia this is unusual, but one pump manufacturer (Accu-Chek) does this. But Medtronic, Vibe, and Tandem pump users can sometimes also take advantage of this! For an overview of the cannula types we have access to in Australia, you might want to refer to my earlier article about these. The Accu-Chek FlexLink teflon cannulae are available as infusion sets in nine forms (6/8/10 mm cannula, combined with 30/60/80 cm tubing). Boxes of 10 sets cost the (current) standard price of $16.70. But the FlexLink cannulae are also available without the tubing, in 6/8/10 mm versions. Boxes of 10 cost the standard price of $11.70. So by buying a combination of infusion set and cannula boxes, you’re cutting down on waste as well as saving a few dollars. The FlexLink tubing comes with a luer-lock connector, so these can be used with Animas, Accu-Chek, and Tandem pumps. 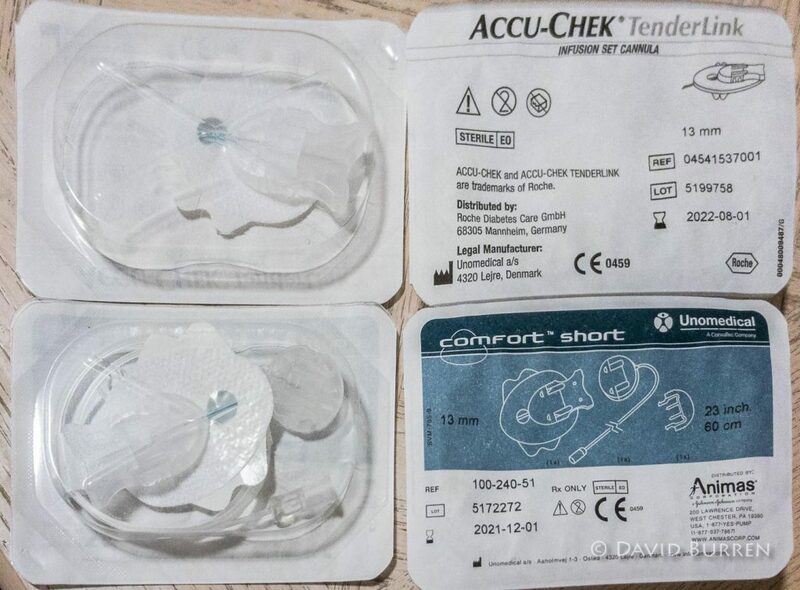 This is Accu-Chek’s steel cannula, and the tubing that comes with this also has a luer-lock connector (so can be used with a few pumps). The Rapid-D can only be purchased as separate cannula and tubing sets. The cannulae are supplied in 6/8/10 mm forms, in boxes of 25 (for $29.30). The tubing is supplied in 20/50/70 cm lengths, in boxes of 10 (for $5.10). Note that the prices quoted in this article are from the 01.04.2018 NDSS price list (still valid as of September 2018). 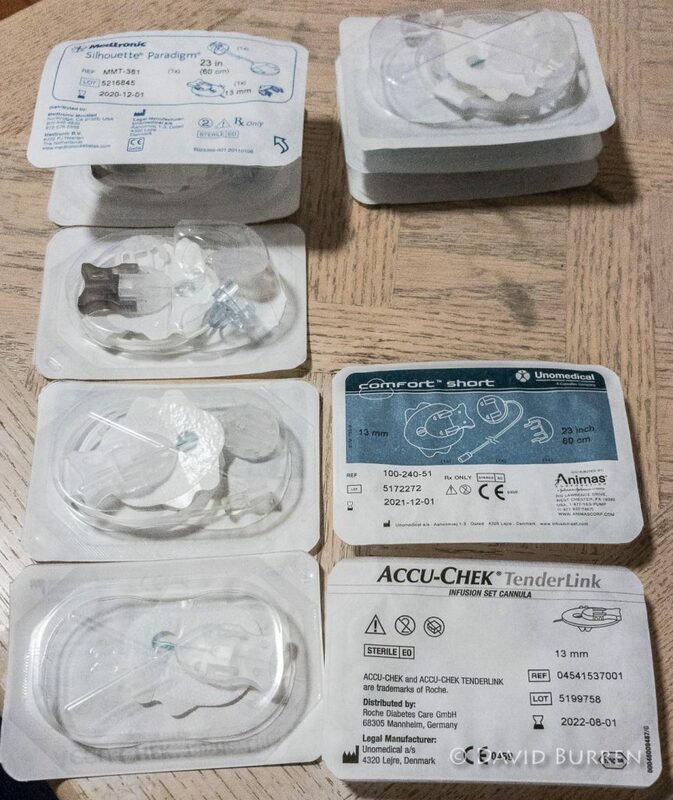 Accu-Chek have the TenderLink 1 cannula, which is available as infusion sets in six forms (13/17 mm cannula and 30/60/80 cm luer-lock tubing, in boxes of 10) for the standard $16.70 price. The TenderLink cannula are much longer than the other cannula models, but that is because they’re inserted at an angle instead of straight in. The 13mm cannula ends up about 6mm deep, and the 17mm cannula ends up about 9mm deep. I find the TenderLink very convenient to insert, and I’ve used them a lot over the last 2 years. The TenderLink is also available just as the cannula component (in 13/17mm forms) in boxes of 10 for $11.70. Where this gets interesting for Medtronic pump users is that the Silhouette Paradigm infusion set is the TenderLink cannula combined with Medtronic-compatible tubing. And for users of the Unomedical Comfort sets (sometimes thought of as “Animas sets” because they were associated with the Animas Vibe) the Comfort Short is exactly the same as the 13mm TenderLink, while the Comfort is the 17mm version. At the top of this image, two Silhouette Paradigm sets are stacked, taking about the same height as three Comfort sets. Below that you can see a Silhouette Paradigm set, a Comfort set (which is identical to the TenderLink set), and a TenderLink cannula (without tubing). The TenderLink cannula can be used with the tubing from the Medtronic Silhouette and the Unomedical Comfort infusion sets! In fact they’re also compatible with the tubing from the Medtronic Sure-T and Unomedical Contact Detach steel cannulae. If you’re looking to experiment with this combined with your own Silhouette/Comfort sets, when talking to your NDSS Access Point (pharmacy) you can refer to the 13mm cannula-only TenderLink with NDSS Code 590, and the 17-mm with NDSS Code 591.